We were walking through the woods on Sunday. The day was quite warm, but the ground still damp from the recent rainfall. All of a sudden we can to a small open sunny area and there were a lot of these beautiful little orange and black butterflies fluttering around. I waited until I spotted this one land on a tree and begin to bask in the sun, and then took the opportunity to sneak in for this photo. Perfect wording . Basking for this Butterfly so beautiful. Gorgeous! I saw lots of dragonflies this weekend. A great shot of this fluttery little beauty! Such a furry body and long antennas! Nice shot! I just finished reading Flight Behavior by Barbara Kingsolver, great book! 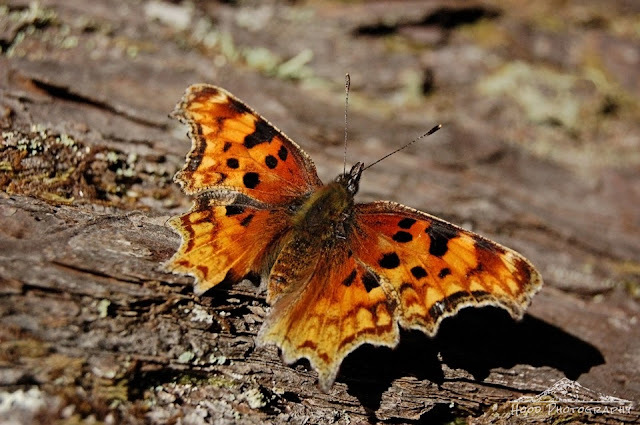 The Hoary Comma is so bright! I like the golden hairs on the body and the irregular edges of the wings. Great photo!